Aarhus, Denmark is hosting the 2018 Hempel Sailing World Championships from 30 July to 12 August 2018. More than 1,400 sailors from 85 nations are racing across ten Olympic sailing disciplines as well as Men's and Women's Kiteboarding. 40% of Tokyo 2020 Olympic Sailing Competition places will be awarded in Aarhus as well as 12 World Championship medals. ©JESUS RENEDO/SAILING ENERGY/AARHUS 2018 09 August, 2018. 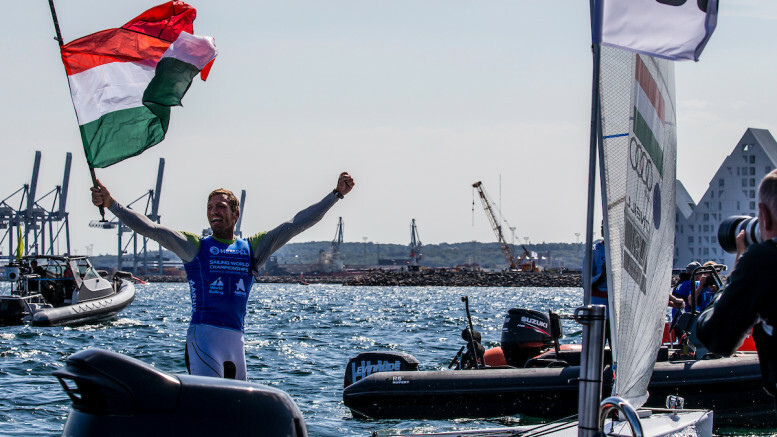 The tears rolled down Zsomber Berecz’s face as he crossed the finish line in Denmark’s beautiful Bay of Aarhus on Thursday to win the Finn and Hungary’s first ever medal in one of these quadrennial sailing world championships. It was the first gold medal to be awarded at these Hempel Sailing World Championships Aarhus 2018 and Berecz’s emotions were heightened by the fact that it has been a long time coming – for him and his country. “I’m a human being and I know what it means for me, my team and my country. It is a big achievement,” Berecz said. However hard it was for Sweden’s silver medallist, Max Salminen, who had led by eight points going into today – day 8 – after an exhausting victory in the storm late on Wednesday evening, it was hard not to feel that there was some kind of karma behind Berecz’s gold. The 32-year-old Berecz had been lying second after only made his comeback six weeks ago following four months out with a thumb he broke in a freak accident whilst doing a good deed for a fellow sailor. Berecz is fast rewriting Hungary’s sailing records. He won silver at the 2016 Europeans in Barcelona and that was only the second medal ever for Hungary at major Finn championships. After only making his comeback from retirement two months ago, Postma, 36, was almost as happy as Berecz. It will have been doubly sweet because he won his national battle within the battle against Nicholas Heiner, 29, who started the day fourth but could only finish eighth in the medal race. Heiner will have to console himself that he finished sixth overall and thus inside the top 8 that the Netherlands strict selection criteria laid down to keep selection for the 2020 Tokyo Olympics open. There was greater heartbreak for Sweden in the men’s 470. The Swedish 2018 European Champions, Anton Dahlberg, and Frederik Bergström, had led by six points overnight – after leading all week – and third place or better would have guaranteed gold. They came last and slipped out of the medals entirely. Having started the day third overall, France’s Kevin Peponnet and Jermie Mion finished third in the medal race and that was enough for gold. Tetsuya Isosaki and Akira Takayanagi – one of nine Japanese men’s 470 teams in Aarhus and one of three in the medal race – started the day second (albeit level on points with the French) and took silver by finishing fifth. Spaniards, Jordi Xammar Hernandez and Nicolás Rodriguez Garcia-Paz, who had started the day in fifth, 14 points behind the Swedes, took a surprise bronze after a magnificent second-place in the medal race. The women’s 470 – the third medal race of the day – had smaller surprises. Japan’s Ai Kondo Yoshida and Miho Yoshioka underlined Japan’s strength in the 470 class by winning a relatively comfortable gold. They started the day top and finished fifth in the medal race but they had done their maths and kept France’s Camille Lecointre and Aloise Retornaz, bronze medallists at the 2016 Rio Olympics ahead of the Japanese crew in fifth, behind them. The French slipped to seventh – in the end, sixth would have been enough for bronze, so close were the margins. In the men’s Laser, Pavlos Kontides (CYP) holds the top spot, discarding his last race. Matthew Wearn (AUS) seemed to have a bad day but finishes the day in second. Elliot Hanson (GBR) moves up to third. Sam Meech (NZL), and Australian, Tom Burton both dropped positions after being protested, more information can be found on the online Noticeboard. Belgium’s Emma Plasschaert leads the women’s Radial with an 11-point cover over Marit Bouwmeester (NED), who is second. Anne-Marie Rindom (DEN) didn’t particularly have a great day on the water but she holds third place. The men’s RS:X races were live today, click here to watch the races. Dorian van Rijsselberghe (NED) tops the leaderboard, with Paweł Tarnowski (POL) in second, and Kieran Holmes-Martin (GBR) in third place. Sime and Mihovil Fantela lead in the 49er class, and Germany’s Tim Fischer and Fabian Graf hold second place. Erik Heil & Thomas Ploessel, also from Germany are third. Austria’s Tanja Frank and Lorena Abicht are first, and Great British, Sophie Weguelin and Sophie Ainsworth are second, Annemiek BekkeringAnnette Duetz (NED) is third in the 49erFX class. Nicolas Parlier (FRA) leads in the men’s Kiteboard, with a 4-point lead ahead of Guy Bridge (GBR). Theo de Ramecourt (FRA) sits in third. In the women’s Kiteboard fleet, Daniela Moroz (USA) holds top spot overnight, with Russian, Elena Kalinina in second. Alexia Fancelli (FRA) is third. “At the end, we crossed the line and we didn’t know anything. We were unsure what position we finished in. We asked our coach, and everyone, but no one knew just yet. Then finally, they checked the results and we were just so happy when we heard that we’d won a medal. 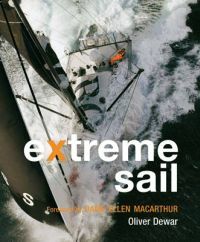 “It was really good conditions, good winds which helped. We had an Oscar flag up and we had to be pumping all the way, but it was nice. We manged to sail well and stay in the front. “We came into the medal race with nothing to lose and we already had fourth place secured, so we just had to give the maximum try and catch a medal. Our plan was just to try and maintain our calmness on the water, while watching the shifts and water pressures – as well as managing our pumping and not looking back.